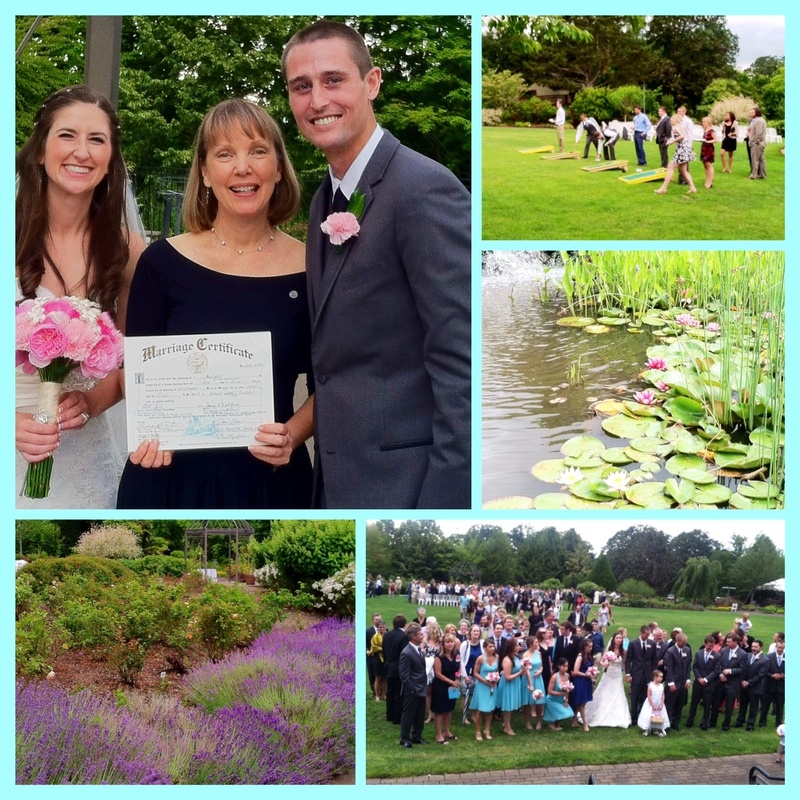 Everything about yesterday’s wedding at The Oregon Garden was heartfelt fun! Almost 200 guests watched as the bride descended the grand staircase and strolled down the grassy green aisle to her beaming groom. Other than a few sprinkles, the rain graciously subsided for the ceremony which included a rose presentation to both sets of moms and grandmothers; and a tree planting unity ritual. Dinner and dancing followed in the Grand Hall which was decked out in shades of blue and a thousand twinkle lights. Lawn games were provided by the groom’s dad who crafted wooden bean toss sets in green and yellow (bride and groom are both U of O grads). Sets were also gifted to the groomsmen in their team colors. The newlyweds are planning a honeymoon to the tropics in the Fall and meanwhile are enjoying being new homeowners in Tualatin. First on the “to do” list: plant their ceremony pine tree. Congratulations, Jessica and Nathan! May the smiles from your wedding day warm your hearts and bless your home for years and years.